The other day I had an epiphany Raphael Saadiq is the dopest producer ever...and yes, I said EVER! Now before folk start naming a rack of folk who may have more accolades, more #1 hit records and more gold and platinum albums then Mr. Saadiq let me break this down with some facts first. Number one, all of that hoopla I just typed doesn't mean anything to me when I'm talking about what makes a producer dope. Second, let me drop a couple of facts that will help me make my case. Saadiq has been making bangers AND hits since I was 14 years old with songs that were the soundtrack to my freshmen year of high school with jawns like "It Never Rains" and "Whatever You Want" and 29 years later (did ya'll get that? TWENTY NINE YEARS!) money is STILL one of the most in demand producer! Can anybody ya'll were just naming 4 lines ago say they've had a 29 year run? Nah...didn't think so. And let's not forget the other Tony Toni Tone bangers that dropped during that time period like "Just Me & You" off the Boyz In The Hood soundtrack, "Anniversary", "Lay Your Head On My Pillow", "Let's Get Down" and the criminally slept on 5 mic classic & my fave Tony album "House of Music." Third, let's dive into some of the bangers AND hits he's produced for other artists from D's "Lady" & "Untitled" (D's biggest hits BTW for ya'll cats who need hits to define a dope producer), Angie Stone's "Brotha" and Erykah's "Love of My Life" to Bilal's "Soul Sista", two more criminal slept on album with Lucy Pearl's debut and Joss Stone's "Introducing Joss Stones" and Solange's grammy winning (yeah, he's got a couple of those under his belt too for you folk who need a statue to tell you how nice you are) song "Crane In The Sky." Now were any of those cats ya'll were naming 9 lines ago, still in the race? Fourth, let's look at Saadiq's solo work starting with his first solo banger off the "Higher Learning" soundtrack "Ask of You" which was BANANAS! His first solo album "Instant Vintage" had the bangers "Be Here" with D', "Body Parts", "Still Ray" and "Skyy, Can You Feel Me" on tap and was a CRAZY debut album and his follow up "Ray Ray" with "Rifle Love", "I Want You Back" and "I Love Her" was dope as hell too. And between his 3rd & 4th albums "The Way I See It" and "Stone Rollin" Saadiq proved that when it came to creating that OG 60's & 70's soul (yeah he was "creating" it not "recreating" it...there's a BIG difference between the two) that he's got that game on lock. So, any of those cats ya'll were naming 14 lines ago still rolling off ya'll tongues? And not to mention the man's musicianship is flat out INCREDIBLE! I mean, who can you really name who's a doper bass player then Saadiq over the past 30-40 years? It's just something about this man's bass lines that stand out from EVERYBODY else. Before I read the credits for Solange's "A Seat At The Table" the second I heard "Cranes..." I was like that bassline is CRAZY so when word got to ear that Saadiq was producing the bulk of the album it all made sense. And Saadiq's strings arrangements going allllllll the way back to the 90's have always been top notch and haven't slipped one bit over the last 20 years. And I'll throw in another 'lil nugget to help bring my point home that may have gone unnoticed by a lot of folk is this dude has been the musical director for the TV shows "Underground", "Love That Girl" and HBO's "Insecure!" 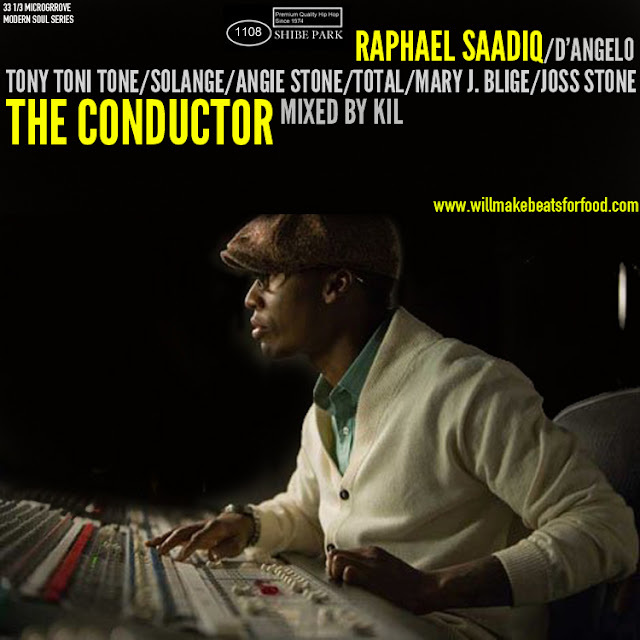 Now, bet money...that at least half of the folk who were calling me crazy 44 lines ago have now come to seen the light but for the other 50% who are still on the fence, try banging out to my "The Conductor" mixtaoe with over 2+ hours and 4+ songs of Saadiq produced BANGERS and see if you aren't seeing that Southern Cali light by the time you're done!